You’re in Central London, you’re short on cash, what do you do? You find a JD Wetherspoon, that’s what! 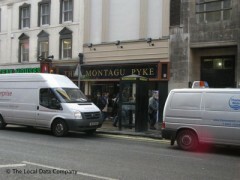 The Montagu Pike on Charing Cross Road is a classic Wetherspoon pub, which means cheap shots, badly named ‘cocktails’, alcopops and great value lager. With £10 in your pocket, there’s nowhere better. Whetherspoons pubs get a bad rap but the food is no worse than at most pubs (except gastropubs which are more like restaurants). The best thing is that it's really cheap, as is the booze - who can argue with getting two main courses for about £7? It gets really busy here because of the location but it's huge. One thing I would like to change is where the toilets are, it always feels like you have to walk for ages to get to the back and up the stairs where they are located!